Twenty-eight pizzas down. Two to go. It's the final of the 2013 Tournament of Pizza -- sponsored by The College of Saint Rose. How we got here: DC's posted a good score in the semi-final meat lover's match-up with Mario's from Niskayuna. And DeFazio's put up a very strong score -- tied for fifth highest in TOP history -- to withstand a solid challenge from Mama Mia's of Saratoga. + This is DeFazio's third straight year in the final -- can the Troy shop finally take the title? + On the other end, this is DC's first year in the tournament. The shop across from UAlbany upset last year's tournament champ -- Marisa's Place of Guilderland -- in Round 2. Can it rally for one more big win? 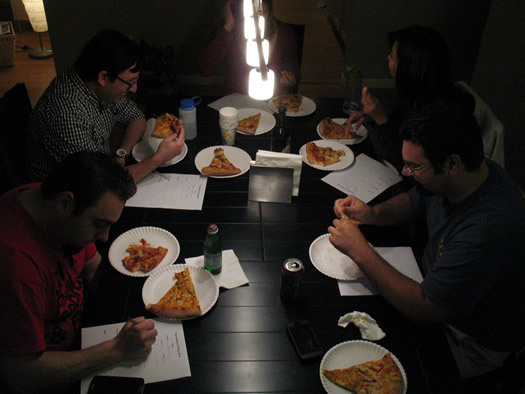 The judges taste the pizzas blind. That is, they don't know which pizza they're tasting during judging. They taste the competitors side by side. Each judge assesses the pizzas by crust (5 points possible per judge), sauce (5 points), toppings (5 points), and overall taste (10 points). Each judge represents either 1/4 or 1/5 of the possible points, depending on the number of judges present. However many judges, all scores will be according to a 100-point scale. In past finals, DeFazio's has gotten creative, maybe to their detriment. This year they stuck with a proven winner: Buffalo chicken. That pizza posted a record-high score of 82 in last year's TOP semi-finals. Yep, they're waving off the other pitches in favor of rearing back and throwing heat. Hard to argue with that. Boom! What a clash! Not only did DeFazio's set a new record for high score, but two judges awarded perfect scores (one to each pizza). DC's crust was described as being "very yeasty" with a "pleasantly chewy" end crust and a "poofy, crunchy" texture. Judges thought it supported the toppings well, though one noted some sogginess. And one judge would have liked it to be a bit more done. But DeFazio's racked up a serious point total in this category. "Amazing!" exclaimed on judge, praising the crust for having good chew and lift. Another praised it for holding up to the toppings. One judge called it the "the best crust in the Capital Region" for its flavor and chew. And another judge said it should be the standard for NY-style crust. 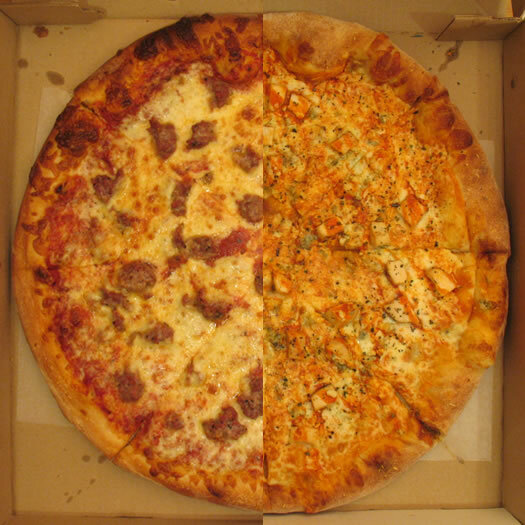 This category included a bit of twist because of DeFazio's choice to go with a Buffalo chicken pizza. The judges said sauce on the the Troy shop's pizza had "good Buffalo flavor" and "lots of spiciness." They were a bit split on the level of heat -- one said it had "just the right level" of heat, and another called it "a little strong." DC's traditional pizza sauce was tagged as "salty, sweet, chunky, thick, comforting." Though a few judges thought its acidity was a bit too strong. DC's and its house-made sausage won this category. Wrote one judge: "Oh, yum. Rich divinity. Sausage has a nice spicy kick and enjoyable coarse texture." Another said the sausage was "very good" and had a "nice fennel flavor." An another praised the the kick from use of black pepper in the sausage. But there appeared to be some variability. A few judges noted some of their sausage seemed to lack that kick. And one was hoping for a bit more of the sausage. DeFazio's won praise for "top notch" ingredients for its toppings. And multiple judges noted the assertive blue cheese ("wowza") that had "a really nice tang," though one thought there was too much of the blue among the "great" mozz. Another recurring comment: DeFazio's chicken, while having good flavor, tended to be a bit dry. This match-up really came down to how the elements of the two pizzas all worked together. 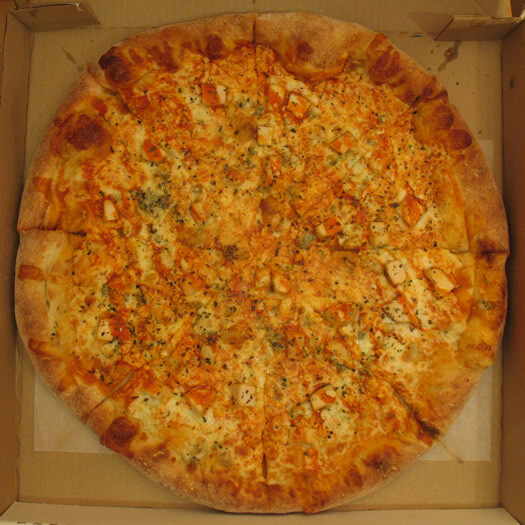 DeFazio's managed to produce a pizza that he judges thought was a great example of the Buffalo chicken variety -- one judge called it "a benchmark" for the type of pizza, "judiciously crafted"; another called it "close to perfect" for a Buffalo chicken pizza. And another concluded it was "a very enjoyable slice." It was that ability to serve as a paragon of the form that powered DeFazio's pizza to a record-high score. But DC's deserves a lot of credit here, too. It produced what was, by many judges' accounts, an enjoyable, comforting classic pizza. In the end, though, DC's just got tripped up a little bit by the crust -- and maybe its choice of such a classic. A few judges noted that the pizza was good -- it just didn't stand out for them. 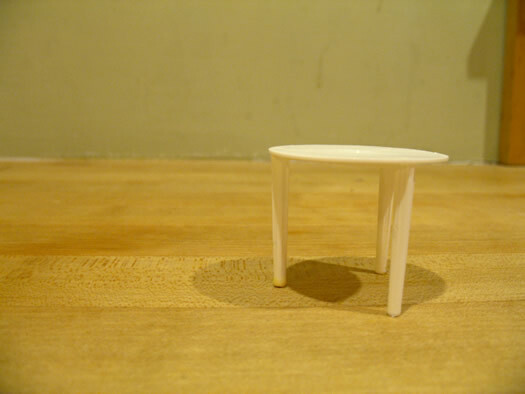 But other judges had a stronger response: "I'd definitely order again. And again," commented one judge. And another: "This is so good. I want to cry tears of salty pizza happiness." There's no shame in losing to a record-high score. A round of applause to DC's for a good run through the tournament. 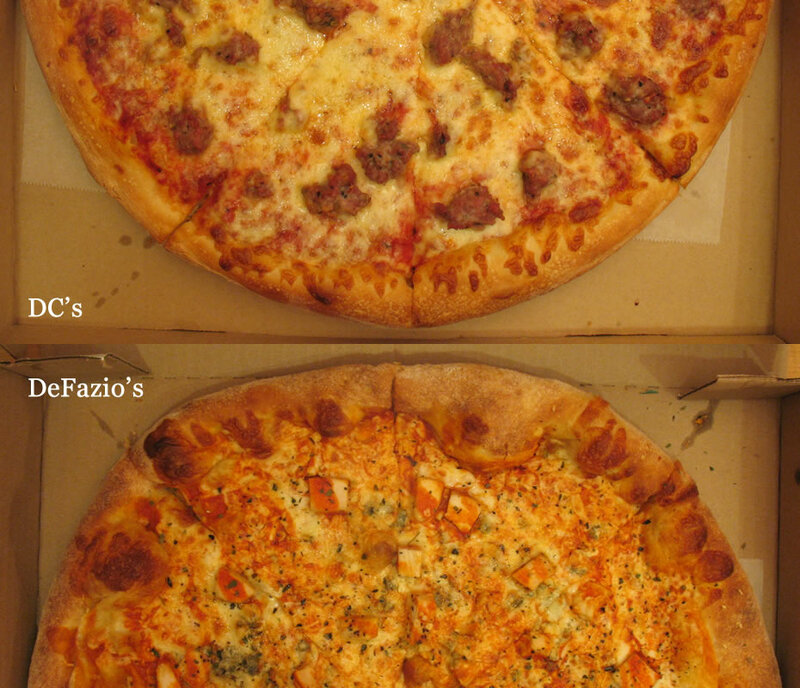 It's been a long time coming, but now we can say it: DeFazio's is the new Tournament of Pizza champion! Congratulations to the DeFazio's family. They've pretty much set the standard for good pizza in the TOP. And the victory is very well deserved. Thanks to everyone who helped with TOP logistics this year. Getting all the pizzas together can be a challenge, and we were grateful for all the help this year. Thank you also to the venues that hosted tastings this year: Skidmore College in Saratoga, Mop & Bucket Company in Schenectady, and the Arts Center of the Capital Region in Troy. Huge thanks to the judges for this year's tournament: Albany Jane, Joe Esposito, Jerry Papandrea, Jeff Janssens, and Innae Park. The TOP is a big time commitment, and we appreciate the seriousness with which they took on the task of judging -- all while making it fun for us. And many thanks to this year's tournament sponsor, The College of Saint Rose. The TOP wouldn't have possible without its support. So... who wants to grab some pizza? 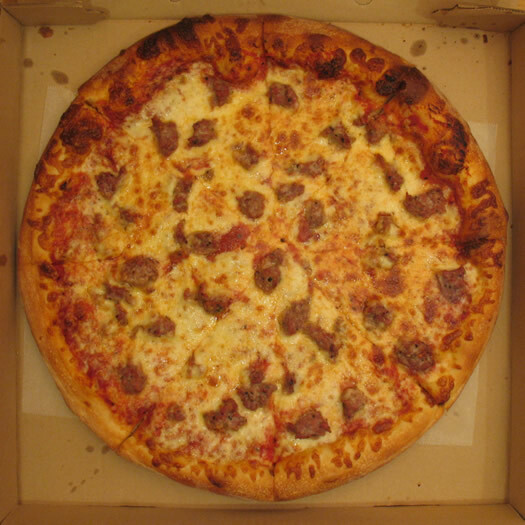 The 2013 Tournament of Pizza is sponsored by The College of Saint Rose. As soon as the front page loaded and I saw that picture of the Buffalo Chicken Pizza, I let go a huge sigh of relief! I knew DeFazios would win if they were smart and submitted that pizza! Hooray! This Troy shop deserves this title!!! Wow! DC pulled a totally badass move and came in a solidly respectable second to DeFazio's unstoppable Buffalo chicken pie. Congratulations to all involved. When I get back I'm going to have to try one of those sausage pies from DC. No doubt. A big YEAH! for our neighborhood pizza shop! DeFazio's is worth a trip up from Albany, folks. They also offer a gluten-free crust: pizza for everyone! I literally threw my hands in the air and screamed "YESSSS!!!!" when I saw the results. Like some sort of crazed sports fan. I have problems. proud of my home team. Congratulations DeFazio's! Their buffalo chicken pizza is awsome and was a smart choice for finally bringing home the trophy. So, last year when DeFazio's was runner up, I said I'd have to try them. And I never did. This year, I'll definitely have to try them... Maybe a lunch pizza is in order? Fine, fine fine. I'll try DC's again. Despite all of my incredulous whining about DC's performance I thoroughly enjoy the TOP. Great work, judges! Woohoo! I love DeFazio's and especially their buffalo chicken. Thank you for reminding me to try DC's again too. Congrats to the Winner! Sounds like DeFazio's is worth a try. While you are all debating the pros/cons, rights/wrongs of the competition, I'll be sitting at the bar at the FOUNTAIN in Albany enjoying the crispiest (best crust in town), juiciest (best sauce EVER), 'garliciest', tastiest pizza in the area, with extra sauce, cheese and toppings as good as anyone's, cooked to well done slightly burned perfection ... while paying full liquid respects to my second tier favorites, Ralph's Tavern, The Orchard Tavern and The Fireside in Schenectady ... and what about The Purple Pub, Guilderland's Pizza Gram Plus, Troy's Testo's, Latham's D'Raymond's, still good pizzas ??? Maybe there should be a 2nd Tournament for Tavern Style pizza's, and then one for high quality restaurant pizza's as well ... I don't think the book has been written yet on the region's finest pizza!